Mix together one cup of warm water, yeast and a pinch of sugar in a large measuring cup. Let the mixture sit until the top becomes frothy. Mix together the whole wheat flour, white flour and salt in a mixing bowl. Slowly pour the liquid into the bowl as you stir. Add the olive oil and continue to stir until the dough starts to form as a ball. Knead the ball of dough until it becomes smooth and stretchy. Sprinkle a little water on it if it is too dry. Cover the bowl with plastic wrap and set it in a warm place. Let the dough rise until it doubles in size. Remove the plastic wrap, push the dough down and knead it one more time. Place the dough on your cutting board and cut it into roughly 8 to 12 equally sized pieces. Roll each piece into a smooth ball. If the dough is sticking to your cutting board, sprinkle a little flour on it. Flatten the balls with a rolling pin. If you don’t have a rolling pin, use your hands. It is up to you how thick or thin you want your pitas to be. Place a pita in the frying pan, cover and let it cook for two to three minutes. Flip it over, cover and let it cook on the other side for another two to three minutes, or until it is puffy. 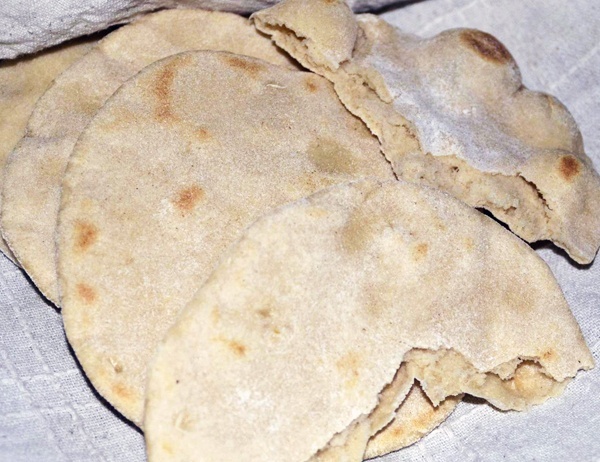 This entry was posted in Breads/Cakes/Rotis/Parathas and tagged pita, Quick Food by Kamakshi. Bookmark the permalink.